“Goi Tom Thit” is Vietnamese savory fragrant salad, made from lettuce, mints, perilla leaves, spicy salad dressing, and topped with sauteed shrimps and white sausage. This salad is served as an appetizer for a weeknight or weekend meal. 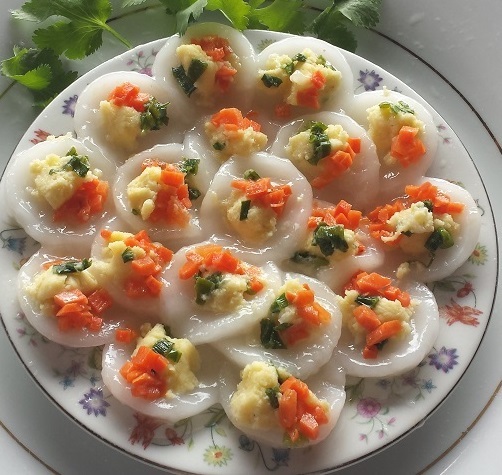 “Ca Chua Nhoi Cha Ga,” is tomatoes stuffed with Vietnamese chicken sausage. In my recipe, I highlight the natural sweetness and flavor of the fresh tomatoes, and also the savory of chicken sausage. This light and delicious dish is served as an appetizer or side dish. In this Vietnamese vegan croquette recipe, I use cooked mung bean and Jícama to enhance texture, taste, also for healthy cooking and gluten-free. Jícama has natural sweetness, crunchy and enhances the texture (not doughy) for croquettes. Mung bean adds flavor and used as egg substitute. “I believe a healthy, gluten-free diet can be easy to achieve. These almond cookies recipe is my creation, and it is definitely healthy and delicious.” (Source: Ms. Lan, Enjoy Life).